Artist in Residence, "Imagine Florida", Coral Springs Museum of Art, Coral Springs, FL. Lead Artist and Coordinator, Coral Springs Water Tower Project, Coral Springs, FL. Workshop Presenter, "Creating Relief Ceramic Tiles", Nova Southeastern University, Davie, FL. Teacher, Coral Springs Museum of Art, Coral Springs, FL. Workshop Presenter, "Design and Create Ceramic Tiles", "Slip Decoration", Broward College, Davie, FL. and Sticks & Stones Studio, Plantation, FL. Workshop Presenter, "Creating Handbuilt Dinnerware", Coral Springs Museum of Art. Coral Springs, FL. and Sticks & Stones Studio, Plantation, FL. Artist in Residence, "the Everglades", Coral Springs Museum of Art, Coral Springs, Fl. Ceramics Assistant, Broward College, Davie, FL. Gallery Assistant, Broward College, Davie, FL. Ceramic Instructor, Sticks & Stones Studio, Plantation, FL. Owner/Operator of The Wallpaper Lady, an Interior Design Business, Pembroke Pines, FL. Craft Teacher, Pines Middle Community School, Pembroke Pines, FL. Craft Designer, The Parsley Pot, Pembroke Pines, FL. Teacher, Elementary and Middle School, Livonia School District, Livonia, MI and the Garden City School District, Garden City, MI. Art Teacher, Mt Pleasant School District, Mt. Pleasant, MI. "By Artists for Collectors", Coral Springs Museum of Art, Coral Springs, FL. 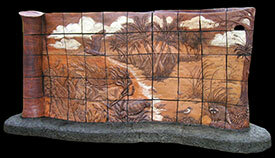 Clay Art South Florida, Featured Artist, Anne Kolb Nature Center, Hollywood, FL. World and Eye Gallery, Fat Village Art Walk, Ft. Lauderdale, FL. Nancy Markoe Gallery, "The Shoulders We Stand On", St. Petersburg Beach, FL. Coral Springs Museum of Art, "Inspired by Nature/Beyond Function", Coral Springs, FL. The Armory Art Center, "New Art", West Palm Beach, FL. Broward Potters Guild Invitational Exhibition, 1st Place, Davie, FL. Gallery 3324, "Objects and Images", Ft. Lauderdale, FL. Coral Springs Museum of Art, "Instructors Exhibition", Coral Springs, FL. Broward Potters Guild Invitational Exhibition, Third Place, Davie, FL. Broward Potters Guild Invitational Exhibition, Best of Show, Davie, FL. Florida Craftsman South East Region Exhibition, Ft. Lauderdale, FL. Broward Potters Guild Invitational Exhibition, 1st Place Award, Davie, FL. A. Houberbocken, Inc, "On the Road Again", 16th Annual Teapot Show, Cudahy, WI. Guilford Handicraft Center, "Biennial Exhibition of North American Clay", Guilford, CT.
Broward Art Guild, "Abstractions", Ft. Lauderdale, FL. Hood College Ceramics Program, "In Flux", Jack Troy Judges Choice Award, Fredrick, MD. permanent installation, Coral Springs Museum of Art , "The Everglades", Coral Springs, FL. Boca Raton Art in Public Places, Sugar Sand Park, "Nature Redefined", Boca Raton, FL. 44th Annual Hortt Competition, juried exhibition, Delray, FL. Broward Potters Guild Invitational Exhibition, 1st Place Award, Davie Fl. Coral Springs Museum of Art, "Great Art Affair", Coral Springs, FL. Broward Potters Guild Invitational Exhibition, 3rd Place Award, Davie, FL. Broward College, "Library Art Exhibition", Davie, FL. Harrison Street Clay Studio, full time exhibitor, Hollywood, FL. Ester Grossman Women's Resource Center, "Three Woman Show", Hollywood FL. Broward Potters Guild Invitational Exhibition, Award of Merit, Davie, FL. Art Space, "Florida Craftsman Exhibition", Ft. Lauderdale, FL. Clay Space, "Selected New Artists, an Exhibition", Miami Beach, FL. Hollywood Art and Culture Center, "Exhibit of Local Artists", Hollywood, FL. Harrison Street Clay Studio, "A Show of Hands", Three Woman Show, Hollywood, FL.